Meredith W. “Mert” Harrison – (91) – of 1724 County Road 16, Beaver Dams, NY (Town of Orange), died Wednesday morning (May 23, 2018) at his home, following a long illness. Born in Point Pleasant, NJ on June 25, 1926, he was the son of William & Marie (Schenker) Harrison. Mert grew up in Point Pleasant, NJ, Cassville, NJ and attended Lakewood High School in Lakewood, NJ. Leaving high school during his senior year to join the US Navy, Mert served his country honorably during WWII touring the South Pacific. He had aboard several ships, including the USS Randall. He was honorably discharged in 1946 following two years of service. Following his discharge from the US Navy, Mert returned to Cassville, NJ and was employed as a truck driver for Ralph Clayton & Sons Trucking Company. In 1950, he moved to Howell, NJ and began working as a heavy equipment operator in the construction industry. Mert eventually joined the International Union of Operating Engineers (IUOE) Local #825, and for over 40 years operated heavy equipment building roads, bridges & dams. He was a member in good standing with the union until his death. He has resided in Beaver Dams since 2008. 18 foot fishing boat. 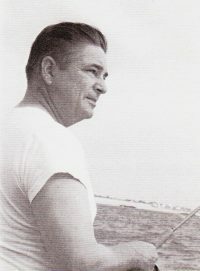 He would spend countless hours fishing along the Jersey Shore for Tuna & Bluefish and also loved “clamming & crabbing.” In his younger days, Mert enjoyed hunting and especially loved deer hunting and rabbit hunting with his pet beagles. 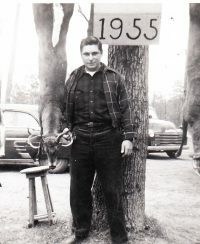 He had been a member of the 7 Bucks Hunting Club of Jackson, NJ and had also belonged to the Jackson Township VFW Post #4703. Mert was married on April 1, 1950 to the former Mae E. Mikkonen who survives. Also surviving are two daughters, Lilyan (Perry) Harrison Baker of Phoenix, AZ and Cynthia (James) Mancil of Beaver Dams; two brothers, William Harrison of Bridgewater, ME and Elwood (Sally) Seiler of Jackson, NJ; two sisters, Ruth (Jim) Martin of Tucson, AZ and Celisha (Frank) Scarpone of Point Pleasant, NJ; 8 grandchildren; 8 great-grandchildren; several nieces & nephews. At Mert’s request there will be no calling hours. Private services will be held at the convenience of the family. Mert’s family request that in lieu of flowers, memorial contributions in his name be made to the Humane Society of Schuyler County, (Montour Falls), PO Box 427 Montour Falls, New York 14865. It is with great sadness that I read today of Mert’s passing. Last month I visited with Gene Hendrickson and he told me of Mert and how ill he was. Reading the above story of Mert’s life brought back wonderful memories from my childhood when we visited with Grammy and Grampy Schenker. We would often go clamming and crabbing. Sometimes we’d go drop-line fishing for flounder….oh how much fun we had in those boats in the bay! My Dad would drive us all down to Cassville and I can look back with such vivid memories on those days with family….lots of family together with good cooking! Now Mert is with my Dad and I would bet that they are reminiscing together with my brother Eddie all about those days of fishing and hunting. May Mert now rest in the eternal sleep of peace.